Slips, trips, and falls can result in serious injury, or even death. They are, however, 100 percent preventable. OSHA has cited fall protection in the construction industry as the number one violation of 2017 and fall protection training takes the ninth spot on the list. As we enter week three of National Safety Month, we focus on reducing the hazard of falling and keeping workers as prepared and protected as possible. The risk of falling does not exclusively apply to industries or worksites where people work at high heights. Every safety manager should be aware of the hazards on their facility. Keep floors in work areas in a clean and dry condition. Train workers about job hazards in a language they can understand. Addressing slips, trips, and fall hazards may seem like a daunting task, but let National Safety Month give you the opportunity to evaluate or update your protection and procedures. 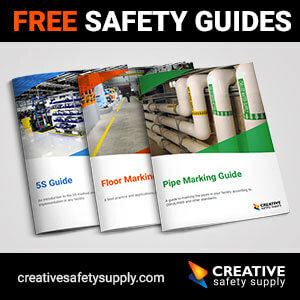 The first step to your process is taking a safety audit around the facility or workplace. Identify and document areas where workers are at risk of falling, places where spills could happen, machines or equipment workers can fall into, and any other hazards. The most common types of fall risks in a workplace include floor access areas, stairway floor openings, ladder openings, uneven surfaces, ledges, manholes, ladders, window openings, open-sided platforms, and many others. There are three categories of fall protection: elimination, prevention, and fall arrest. The first is to completely eliminate the hazard altogether. For example, if your warehouse has a raised walkway, consider creating a path around the obstacle instead. This will entirely eliminate the possibility of a worker falling off the walkway. Eliminate the hazard of tripping by ensuring aisles are consistently clear of clutter. If your worksite has manholes, place a cover or grate over the opening to eliminate the chance of someone falling in. Fall prevention works with hazards that cannot be fully erased from the facility, but the risk is greatly reduced with prevention strategies. Adding guard rails or rails in the stairway can keep an employee balanced by giving them something sturdy to hold onto if they begin to fall. Use floor marking and hazard communication signs to warn those of ledges nearby, cords that are a tripping hazard, or use a “Wet Floor” sign in English and Spanish to alert workers of slippery surface. Having required spill kits around the facility will also ensure spills can be cleaned up quickly, reducing the prospect of a worker slipping and falling. Finally, an employer needs to provide personal fall arrest systems if workers will be suspended from heights or are working in a position that can lead to falling, usually at industrial or construction worksites. Fall arrest systems are a component of PPE and is designed to eliminate or reduce the energy of a fall, “arresting” the worker before they can fall to the ground. It is crucial to ensure these fall arrest systems fit employees properly, and include an anchorage point, body support, and sturdy connectors. In most cases, a combination of personal arrest systems and guardrails will provide ample fall protection. It is your job as the employer, however, to identify all risks, conduct trainings, and providing equipment to employees. Rescue procedures: Documenting the procedures your facility has in place in the event of a rescue operation will keep you and your workers prepared for an emergency. Be sure to include specific areas where falls may occur and how a rescue will take place. Investigation processes: Any time a fall occurs, whether or not it results in injury, should be investigated and recorded. In each instance, identify what led to that fall and what preventative measures can be made moving forward. Fall protection policies: Any policies the facility has in place regarding fall prevention needs to be recorded and kept in once central location. Include as many details as you can, including guardrails you’ve installed or what types of PPE is available onsite. Evaluating effectiveness: You should routinely evaluate the effectiveness of your workplaces fall prevention efforts. Depending on results, make changes as necessary or make notes of effective strategies that can be used in the future. Whatever type of industry you work in, it is your responsibility as the employer to create a safe workplace for all. Celebrate week 3 of National Safety Month by reviewing your fall prevention procedures, equipment, and training and look to see how you can improve them!